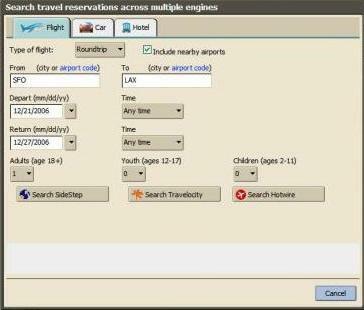 Click on the Travel Agent icon to bring up the reservation dialog. Drag-and-drop a contact onto the Travel Agent icon - the destination fields in the dialog will be pre-populated with the contacts address and nearby airports. Drag-and-drop an appointment onto the Trave Agent icon - the dates will be prepopulated with the start and end dates of the appointment. The departure date will be set to one day before the start date of the appointment. Looks great! When you drag the contact to the Zimlet the popup arrives with the closest (I assume) airport to the location and looks ready to rock - then you clikc the buttons to search from the three choices available...Regardless of which option is chosen, you get nothing. It forwards you to a website (myplanner.org) which has been allowed to lapse, as indicated by the 'Network Solutions' warning at the top of the page:"myplanner.org expired on 12/22/2010 and is pending renewal or deletion." Installed (will uninstall). Selected a flight search and then clicked a search provider and then went to a website (with 2 opened tabs) that did not offer searches. I was actually hoping that the service (myplanner.org) would have renewed their domain / website, but apparently not. Basically still a dead zimlet.Perhaps someone can modify it for use with the other travel search engines?It sounds like a useful tool to have. Beach Spa Resorts Gives The "Travel Agent" 5-Stars! This travel portal or booking engine for hotels, flights and cars is super user-friendly and though claiming they are a "great deal" has become so commonplace and cliche, but I actually went through and compared 3 hotels and 3 flights. The flights were as suspected pretty much even with tthe other mainstream travel companies. But the hotels actually were realizing a 12% savings amortized between all the bookings. The 2 priorities of a search engine is its ease and functionality and secondly if indeed it can save you money. It clearly has passed my rather critical nature, with flying colors. I give this a 5 star rating. In partnership with Expedia and Hotel.com I launched Beach Spa Resorts which only features beach resorts with in-house spa services. A highly specialized niche of luxury resorts, only found in coastal cities. The point I am going to get at is there was a time when finding an unbiased review was difficult as we were all competing. Happily I can say I have no vested interest in this "Travel Agent" yet solidly recommend it anyways. I am finally in a less competitve niche, therefore can make my peace with all the other on-line travel providers. So, without further ado, "download" away and happy travels!